After serving as Netflix’s chief financial officer for 11 years, Barry McCarthy has stepped down, according to a statement released by the company. McCarthy oversaw Netflix’s financials as it grew from a small upstart DVD-by-mail provider to a major player in the home entertainment industry. Just what those “broader professional duties” might be remains to be seen. It will be interesting to see if McCarthy can join/found a company that reaches the dizzying heights that Netflix has achieved in recent years. Will the company feel the sting from the loss of one of its core power players, or will the Netflix juggernaut roll on unimpeded? McCarthy is leaving at just the right time. That sweetheart streaming deal through Starz will expire next year, and renewal, if it happens at all, will be on terms much more favorable to Starz. Netflix has already paid dearly for output deals with a number of studios. Bandwidth costs will increase as Level 3 passes on surcharges imposed by ISPs like Comcast. There’s only so much added overhead Netflix can pass on to its subscribers. The financial picture at Netflix is about to get a lot more cloudy. Yea, I think all the major studios are going to be ganging up against Netflix along with the cable companies for taking away all their business. It won’t be so easy for them in the future. Dopey question. 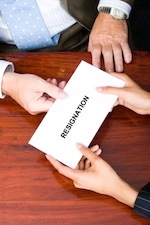 There’s never been a time in any company when the CFO quits or is fired and there is a ripple in the pond. It’s “Next accountant step forward”. Anything else is just analyst speculation to fill up space for the sake of filling up sapce.